This is a maquette I made for the Open House art show at SCAD Atlanta. He’s the main character from a story I’ve had floating around in the form of notes and sketchbook pieces for a long time. This character was a lot of fun to make. I hope you all like this creepy old man who has a pension for collecting rats as much as I like him. 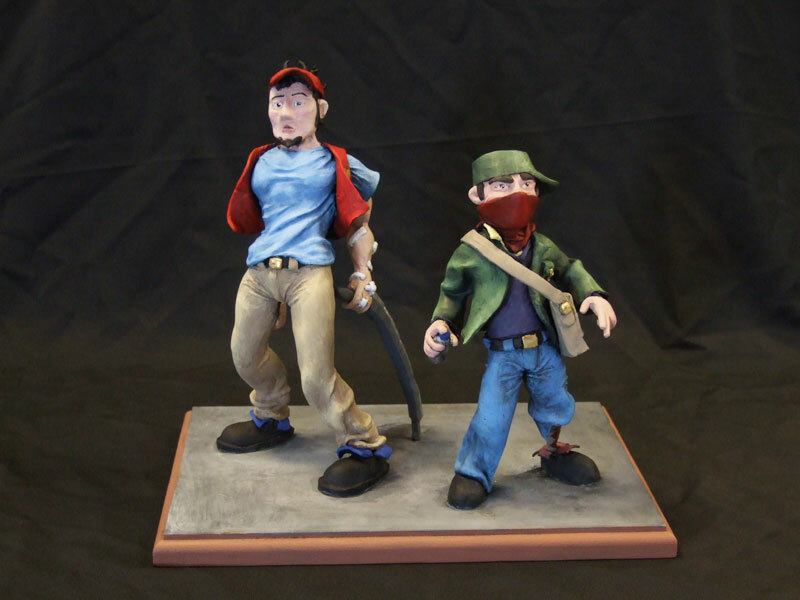 This is a sculpture I did of two characters I created. It was done with Sculpy and acrylic paints. I really like the energy they give off, even when they’re just standing still. This is a sculpture I made of a Viking character that I created name Olaf Hauskludson. He was sculpted using epoxy putty and Sculpy, and painted with acrylics. I really pushed the balance of sculpture by lifting most of the energy and weight up off the base and into the air. I think this created a very nice dynamic piece. I’m glad to have him back home from being displayed at SCAD-Atlanta.